Sahara Reporters says Rice farmers in Sokoto State, Nigeria have lost an estimated 61, 197.5 tonnes of rice valued at N27.5 billion due to flood. The website quoted the State Chairman of the Rice Farmers Association of Nigeria (RIFAN), Alhaji Ibrahim Salihu as saying this when the Association visited some of the affected farms on Thursday 18th October 2018. 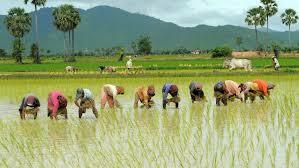 It was also reported that the flood affected 19, 000 rice farmers across the 23 local government area of the state. According to Sahara Reporters, Salisu said: “Based on the estimates, the cultivated farms’ yields lost to floods are 61, 197.5 tonnes, because farms were submerged by rainwater and crops destroyed before harvest. “Yields lost can be quantified to be 3, 059, 875 bags, while if converted to money, each bag of 100kg is N9, 000 at open market, therefore, at least about N27, 538, 879, 000 was lost”. The Nigerian Agricultural Insurance Company (NAIC) has been approached by the farmers for remedy. The Federal Government have also been appealed to, to ameliorate the farmers’ plight.